The survey was conducted by L’Oreal, but the methods were not revealed. Therefore it is not possible to determine if the results can be extended to the adult population in general. Nevertheless, the poor showing on naming a famous scientist is an indictment of the science education of those who participated in the survey. I’m interested in how the readers of virology blog would respond to the question, ‘Name a scientist’ – it doesn’t have to be a famous scientist, and it should not be a relative, or the author of virology blog. Don’t look up someone in a book or online – I’m interested in who you would think of spontaneously. Post your answer – just one scientist – in the comments section, or send it to virology@virology.ws. I’ll reveal the results here in a few weeks. In attempting to determine how the L’Oreal survey was conducted, I learned about the L’Oreal-UNESCO For Women in Science Program, an effort to celebrate women who have dedicated their careers to scientific research, and to encourage emerging talent to pursue scientific discoveries. It’s a commendable program, and I do hope they impress upon the recipients of these awards the need to educate the public about their work. A simple advice that has saved a whole lot of lives since the 1840s. Newton was the first one who came to mind, then Galilei. Stephen Hawking leaps to mind. I would say Vincent Racaniello, because I just read this, and it's right there–and there's no discounting that fact. Then I probably would have said Mendel. 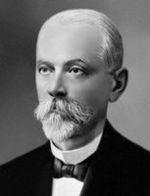 Dimitri Iosifovich Ivanovsky the Russian biologist who was the first to discover viruses. Sylvia Earl. Eugenie Clark. Ada Lovelace. Rita Colwell. Nancy Chang. Diane Fossey. Marie Curie. Rosalind Franklin. Gertrude Elion. Rita Levi-Montalcini. I wonder how much of the general population can name a female scientist? readers can do so, when I compile the results. Nikola Tesla or Rosalind Franklin!